» NEPA: Vetstock Wreath Laying Ceremony Ride Warriors' Watch Riders: WE HAVE YOUR BACKS AT HOME! We had the honor and privilege of being asked by our local CVMA Chapter to lead a ride to Veterans Memorial Park in Matamoras,Pa. for a wreath laying ceremony. Silverhawk & I were also asked to be participants in the wreath laying ceremony. We had the honor of laying a wreath at the Cold War Era monument. The park has monuments for World War II, Korean, Vietnam, Gulf Wars, Revolutionary War, Cold War, and 911. In addition, a monument that commemorates the visit of the “Moving Wall” a replica of the Vietnam Memorial Wall in Washington DC, that was on display in 1998, and a piece of granite from the WWII Memorial in Washington, are also parts of the Vet Park structure. The Matamoras Monument dedicated in 1949 to WWII residents has been moved to the park also. When finished, the Park will have monuments for French and Indian Wars, War of 1812, Mexican War, Civil War, Spanish American War and WWI . 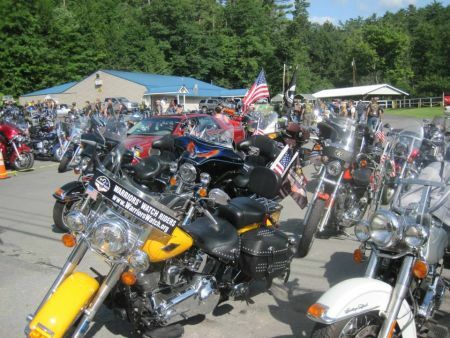 Vetstock is an event put together by our local chapter of the Combat Vets Motorcycle Assoc. 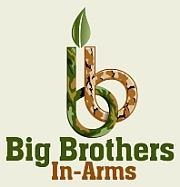 This year the event would raise funds for Homes For Our Troops, and specifically for Cpl. David Noblit’s new home. David was on his second deployment when he lost both of his legs above the knees, and suffered severe damage to his left arm in an IED blast in Sangin, Afghanistan on October 21, 2010. Cpl. Noblit took part in both the ride and wreath laying ceremony. 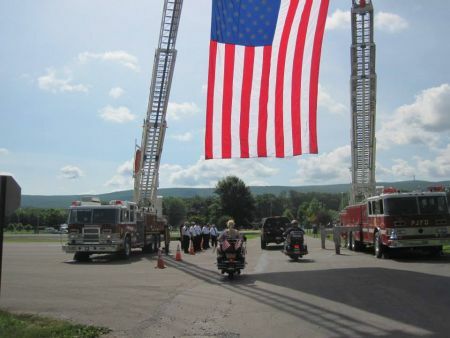 Milford Police & Fire lead the ride, Dingmans Twsp FD provide a ladder truck with a flag as we left town and Matamoras FD and Port Jervis FD ladder trucks to form an arch as we entered Memorial Park. 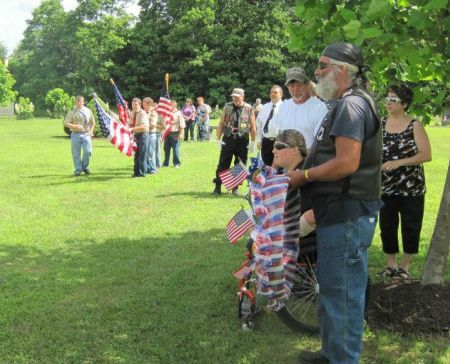 No user commented in " NEPA: Vetstock Wreath Laying Ceremony Ride "